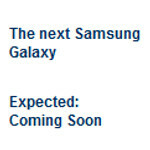 Carphone Warehouse changes teaser page to call new model "The next Samsung Galaxy"
Amazon Germany started it all nearly a week ago by putting up a page to accept pre-orders of the Samsung Galaxy S III. To display how heavily anticipated this phone is, the unannounced device immediately went straight to the top of handset sales for the site. That was followed by a web page put up by Vodafone to announce that it will be carrying "the next Galaxy". Now, another prominent overseas smartphone retailer has put up a page. U.K.'s Carphone Warehouse is alerting everyone to the fact that the next Samsung Galaxy is "coming soon" and will available for "all major networks in the U.K.," according to the site's sign-up page. Originally, Carphone Warehouse called the device the Samsung Galaxy S III. But amid speculation that the sequel to the immensely popular Samsung Galaxy S II might have a different name at launch, the retailer has changed the name of the phone on its site from the Samsung Galaxy S III to "The next Samsung Galaxy". Outside of Amazon Germany's 599 EUR price tag ($792 USD), none of the other pages have included a price tag. Of course, it is all guesswork until the Korean based manufacturer lets the cat out of the bag at the May 3rd Samsung UNPACKED event in jolly old London. Besides the name of the device, the price and date of availability, everyone is on pins and needles awaiting to hear about the phone's specs. Some are tipping the device to being an incremental update while others forecast (or hope for) a 4.7 inch display with a quad-core Exynos processor, 1GB or more in RAM and a double-digit MP camera on back. Even if the Galaxy S3 hardware is ready samsung cant launch it becoz they are still working on Stable Version Of ICS. They have released buggy version for galaxy s2. "becoz"? Really? You abbreviate to save yourself two letters out of seven? How about "b/c"? Sometimes abbreviations don't seem expedient; they just make it seem like you're hiding the fact that you can't spell.